A Festival of Skeletons by RJ Astruc – GONE after Friday! The very first novel that Crossed Genres published, RJ Astruc’s darkly comic A Festival of Skeletons, will go out of print after this Friday, November 30! 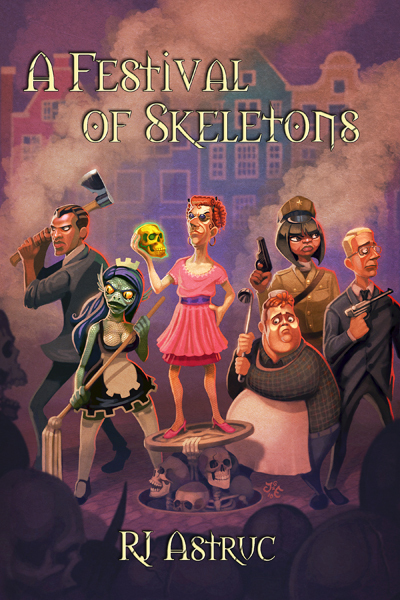 A Festival of Skeletons is like a love child of Terry Pratchett and Robert Rankin – a pacy, intelligent comedy novel that’s crazier than a cat on catnip, with excellent characterisation that doesn’t take itself too seriously. Highly recommended. RJ Astruc spends her days writing all manner of fiction and telling people what to do. This includes her husband (who took her name) and her baby (who laughs at fingers). She does science fiction and fantasy. Her website is http://www.rachelastruc.com. 5 days left to get a copy of A Festival of Skeletons!